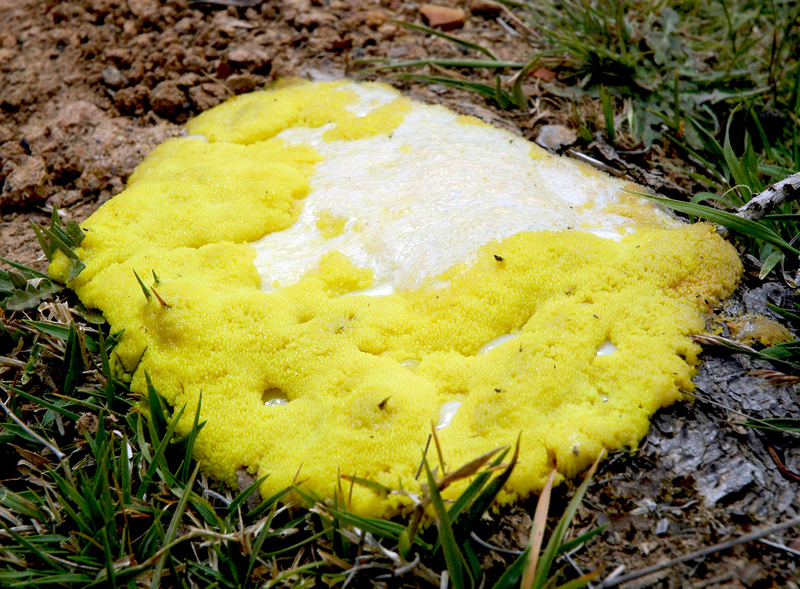 Slime moulds are single celled organisms, but can stretch many centimetres across. Packing millions of nuclei, they are currently considered protists (a group of life pretty much defined by what it isn’t) having previously been thought of a fungi. Colours range from a delightfully putrefied green to hint-of-vomit yellow. They have no nervous system, and creep around at a stately 1cm per hour. But what the slime mould lacks in brawn (or legs, eyes or any kind of recognisable organ) it makes up for in some pretty nifty problem solving abilities. Research from Hokkaido University, in Japan, demonstrated that slime moulds are capable of solving mazes. Slime moulds were chopped up, and placed throughout a maze. The maze was without food, but there were pieces food placed at either exit of the maze. The first thing the lil’ slimes did was extend and join together, returning to one big slime. Then the slime mould began to retract from the dead ends of the maze, until it was only present as a tube through the shortest path in the maze with either end attached to the food source, sucking in tasty, tasty nutrients. This is wicked as it demonstrates a form of computation (working out how to exploit food sources) in the absence of multi-cellurarity. The slime has a collection of similar parts that perform the computing in parallel. That’s right, this humble slime is acting like a multi-core computer. Latterly they also demonstrated that slimes can anticipate regular events, and even before the event (a blast of dry air) they start responding (slowing down the rate of movement). Quite how something without a nervous system is capable of memory and anticipation boggles my mind. That was in 2008 though, so whats new? More recently researcher Dr. Chris Reid has been re-lighting the slime mould torch, with more cool results. His work has demonstrated that this brain-less, single celled organism also has spatial memory. By getting to a food source behind a U-shaped barrier, the slim demonstrated it was doing more than simple gradient-following, and passes a test commonly used in robotics. Once again, every time we think we are making a step forward, we find old mother nature’s pet slime waiting for us, quivering quietly in contempt. Finally, and the thing that inspired me to write this piece in the first place, is work Chris spoke about at the recent Behaviour 2013 conference in Gateshead (with yours truly in attendance). The talk was titled “Blob breaks bank” (great tip, giving something a snappy name and people will look at it, even if they have no interest in the session the talk was being held in) and helped open my eyes to a whole world of slime tinged wonder. He showed that slime moulds can solve the the “two-arm-bandit problem”, where you have to choose between staying put and working a known reward system, or switching to another and exploring its potential. He placed slime moulds between two unequal food sources, and then recorded their gradual movements. As if acting intelligently, the slime first spread out to sample the two food sources, and then moved its entire body (mass? self? collective? wobble?) over to the high-quality food source. Reducing the difference in quality between the two food sources simply slowed the slim down as it ummed and ahhed over which food source was best. This is the great thing about conferences. As I alluded to in my previous post about travelling abroad, they are a great opportunity for me to further my professional ambitions by giving a talk and networking in my chosen field. However, the sheer volume of talks of weird and wonderful things also lets you learn so much about something you may never have come across. Plus now I know that something so simple can do such complex stuff I really think differently about the mind and thought. *Credit to Chris Read for beating me to this joke here. This entry was tagged biology, computers, decisions, fungi, ghostbusters, protist, slime. Bookmark the permalink.